Until two minutes ago I had never heard of Loof. Now I am in love with Loof. 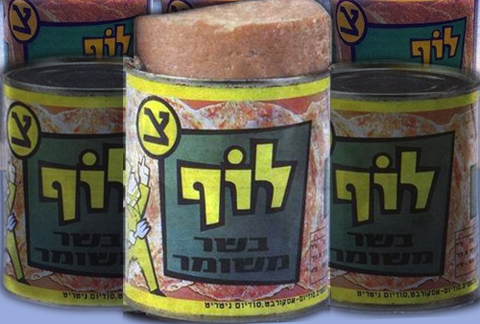 Loof is a kosher, poultry-based Spam variant created by the Israeli army. “[N]o product has ever been hated with more affection,” says blogger Rachel Neiman in Israelity. Neiman says that the name is derived from the word “loaf,” as in tinned meat loaf, and is a terminological remnant of the British Mandate in Palestine. (Other such “Hebrew” words: “jerrikan” for “jerry can,” “gooznik” for “goose neck” and “bek ex” for “back axle.”) Looking at the Hebrew on the can, I would have thought the word was pronounced “Loaf,” but Loof is way funnier, so I’m going with Loof. After I have no idea how many years (does it date from 1948, like the Israel Defense Forces? From 1923, like the British Mandate?) the IDF is finally eliminating Loof. Because it is disgusting. The new MREs (meals ready-to-eat) will be fresher and healthier and will not require heating — they’ll be wrapped in an “exothermic chemical heater that warms the packet in minutes upon contact with water.” Meshuggeh! Loof, I hardly knew ye. Or as Neiman put it, Farewell, my Loof-ly. Previous post: scharf mural done! Next post: be in a book, do good!